NOTE: The name of the exam has changed from IT Fundamentals to IT Fundamentals+ (ITF+). However, the FC0-U61 exam objectives are exactly the same. 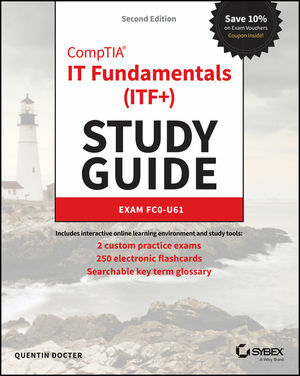 After the book was printed with IT Fundamentals in the title, CompTIA changed the name to IT Fundamentals+ (ITF+). We have corrected the title to IT Fundamentals+ (ITF+) in subsequent book printings, but earlier printings that were sold may still show IT Fundamentals in the title. Please rest assured that the book content is 100% the same. QUENTIN DOCTER, A+, MCSE, CNE, CCNA, SCSA, has spent more than 17 years in the IT field. His experience includes technician, network administrator, consultant, trainer, author, and web developer. He is presently an IT consultant and well-respected author.